Kyoto Tower, the Imperial Palace and Higashi Hongan-ji Temple can all be found in the central area of Kyoto Japan. Popular tourist attractions in Eastern Kyoto include Kiyomizu-dera Temple, Maruyama Park and the massive Ryozen Kannon Buddha. 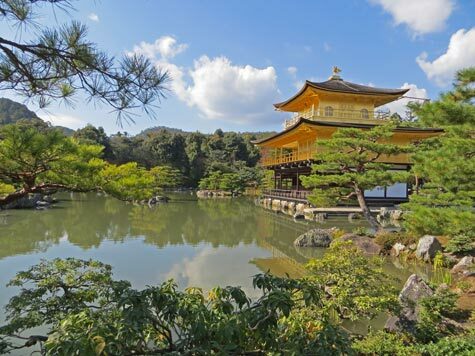 In addition to beautiful ponds and gardens, Kinkaku-ji Temple (Temple of the Golden Pavilion) and the Ryoan-ji Temple are top attractions. Overview of transportation services including the Kyoto metro system, bus network, central train station and the two nearby airports.